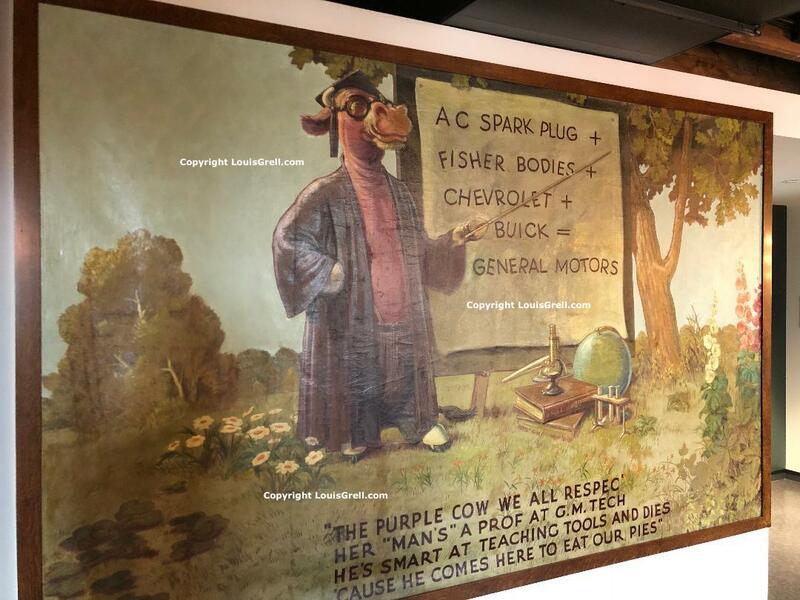 Again, another late night research discovery this time involving the Purple Cow murals. Beginning in June 1942, the Durant Hotel in Flint Michigan (named after William “Billy” Durant [1861-1947] co-founder of General Motors and founder of the Frigidaire brand) was renamed the Pick-Durant after Albert Pick acquired rights to the property and commissioned Grell to once again paint locally flavored Purple Cow murals. Seven in all were created and installed in 1942 and were saved by a waitress in the 1970’s and acquired by Kettering University. The University selected two of the more locally themed murals to be restored and now hang on the walls of its archive building and are shown here. The other five are in storage and awaiting some conservation work. Many thanks to Kettering University and Gregory M. Miller, Director Special Collections & University archives for sharing the photos and the amazing story behind the murals survival. See more about the murals here.